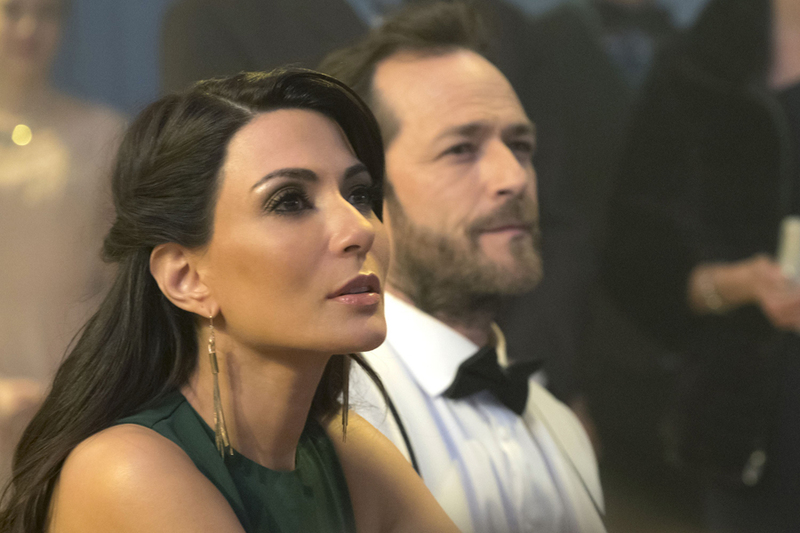 It’s Homecoming and Reunion weekend at Riverdale High and everyone has a lot on their plate (and no I don’t mean hamburgers). 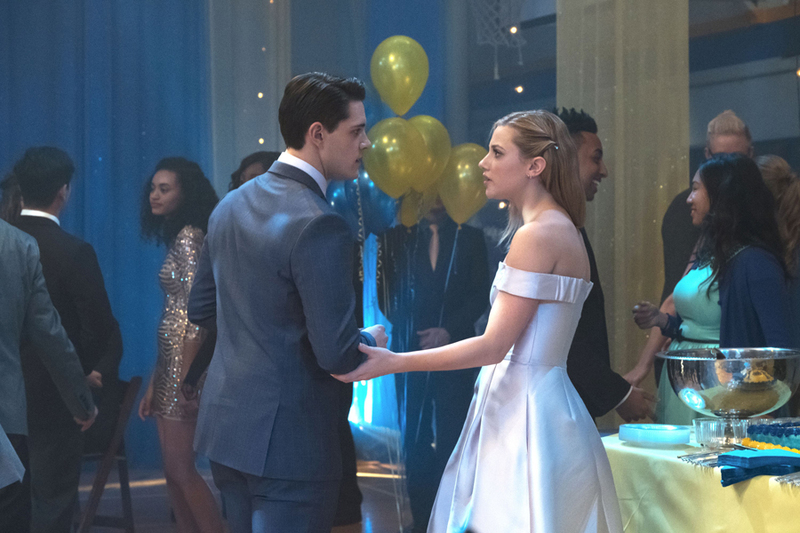 This episode, written by creator Roberto Aguirre-Sacasa, kicks off with a completely overwhelmed Betty planning the dance and dealing with her overbearing mother. 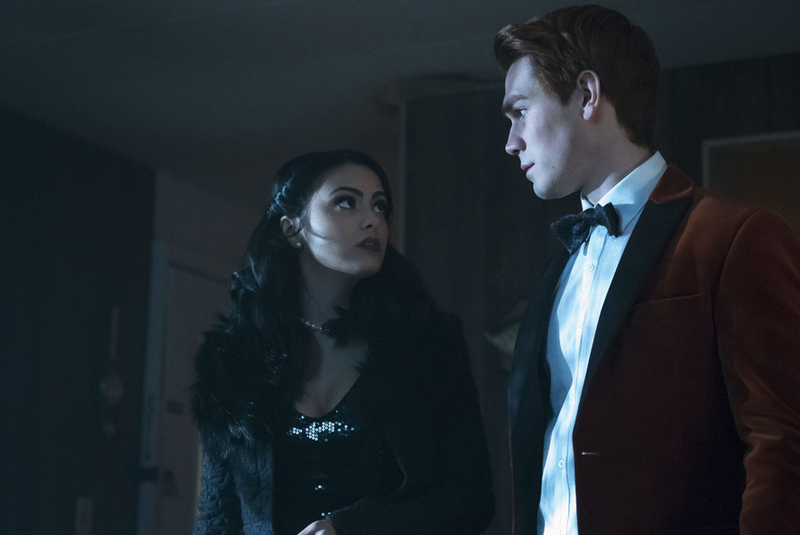 Mary Andrews adjusts to being back in Riverdale by spending some time catching up with Archie, while Hermione and Veronica get the “good news” that Hiram will be released soon. 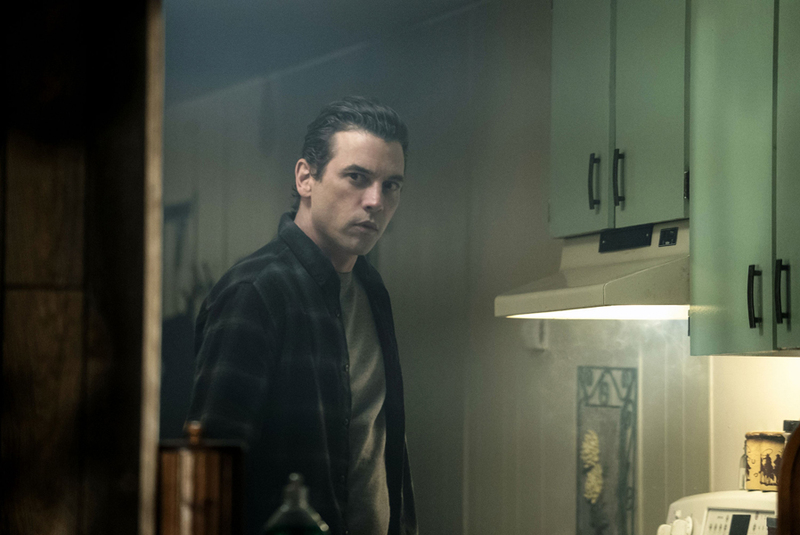 Jughead returns to the trailer park with coffee and donuts to find a clean house and a freshly shaven F.P. It seems as though all is looking up in the Jones house, F.P. even read Jughead’s manuscript. 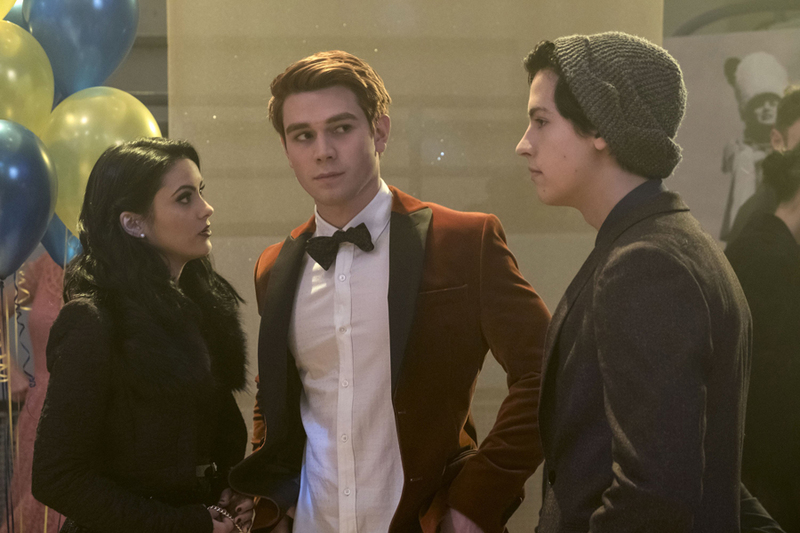 Archie is eager to discuss the secret evening he spent with Veronica and she lets him down easy with “I don’t have the bandwidth to explore anything with anyone right now” before running off to the Blue & Gold office where Alice tries to rope the girls into investigating F.P. Veronica is game, but Betty is standing by Jughead’s belief that his father is innocent. Veronica goes behind Betty’s back and agrees to snoop for Alice. She tries to drag Archie into it but, deciding to be a good friend, he won’t go behind Jughead’s back, for the moment anyway. It’s not until Jughead expresses a desire to move back home and mentions F.P.’s interest in the manuscript that Archie becomes suspicious. In a sweet, yet misguided attempt to look out for his friend, he agrees to help Veronica search the Jones trailer for evidence. After a thorough inspection of the trailer, they come up with nothing connecting F.P. to the murder. Varchie share a kiss and head to the dance. Alice invites Jughead and F.P. over for dinner before the dance, so she can grill him and Varchie can search the trailer. Jughead, unknowing, is so excited; he thinks its important their families get to know each other. Awwwww… Betty, however, is wise to her mother’s scheming and confronts Alice. The boys join them for dinner anyway and Alice spares no time interrogating F.P. A timely interruption from Hal almost gets us out of this awkward dinner party, but not before F.P. alludes to knowing about Alice’s abortion. He drops the kids off at the dance and Jughead asks if he can come home. F.P. suggests they move to Toledo, where Jughead’s mother and sister are currently living. Meanwhile over at Thorn Hill, Polly is snooping around and discovers Clifford Blossom’s room full of wigs and a grey haired Clifford in the room. Polly suggests to Cheryl they borrow some of Penelope’s jewelry for the dance. Once in the room, Cheryl tells Polly “legend has it”, her father went grey overnight after seeing the ghost of Grandpappy Blossom with his throat slit… hmmmm… The girls find the ring Jason proposed to Polly with; the one she thought was missing. Which means… The Blossom’s saw Jason before he died. Penelope spins some tale about Jason throwing it at them when his disowned the family then gives Polly a spiked milkshake. She falls asleep, leaving Cheryl to attend the dance alone. Later on, she tells her parents she disposed of the ring, ya know, just in case it was incriminating. Of course, we know Cheryl, so we know better. By episode’s end, we see Cheryl still has it. Fred arrives at the dance looking dapper with Mary and Hermione on his arm (Mary invited her). Mary and Alice have a snark fest in the bathroom and I really want Molly Ringwald to stay around so someone can give it to Alice on the regular. Veronica reports to Alice but not without Betty noticing. Betty is mad as hell and ready to confront them, but Archie and Veronica take to the stage to sing a cover of Kids in America. For those who saw the preview, Betty looked upset over Varchie, not to worry Bughead fans, she is unfazed by the flirty performance. Their singing is juxtaposed with clips of Sheriff Keller searching F.P.’s house, finding a lock box with the gun that killed Jason, and arresting F.P. Betty takes Veronica and Archie to task for going behind her back. 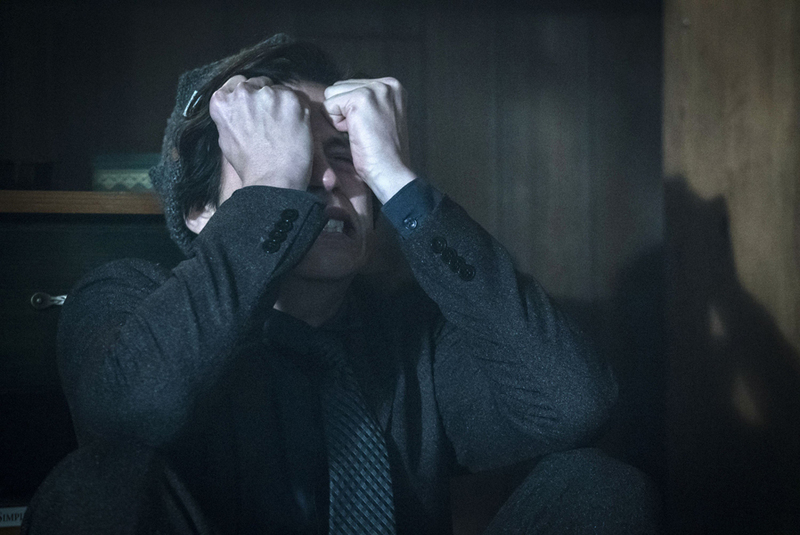 Jughead is seven kinds of pissed off at all of them (can’t blame him), but he doesn’t have too much time to process because Kevin, Alice, Fred, Mary, and Hermione break the news about F.P.’s arrest. A devastated Jughead flees the school, running home to take his anger out on the furniture. He collects himself and with a determined look, heads back out. Betty rips into Alice and declaring her love for Jughead (aww Bughead) heads to Pop’s to find him. She doesn’t find Jughead, but she does find Veronica and Archie who tell her they believe F.P. is being framed because there was no lock box there earlier. Polly gets a daily milkshake? I want a daily milkshake. 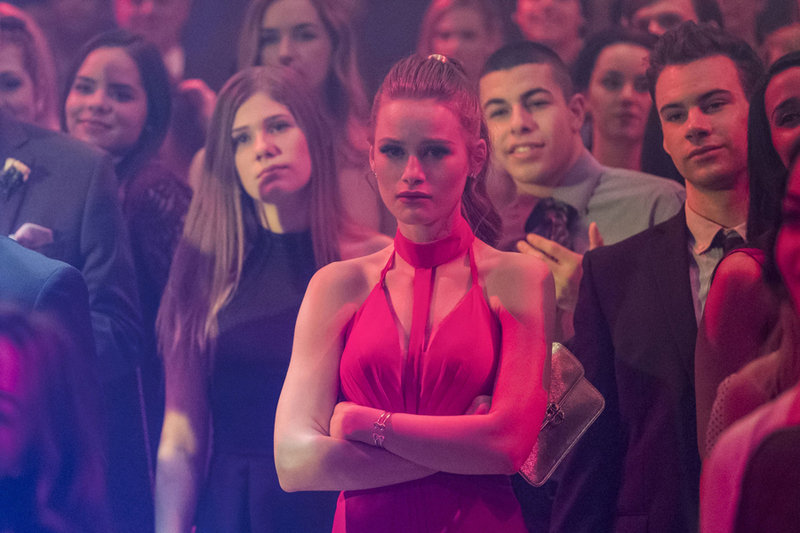 Betty’s homecoming look is stunning. Not enough Josie and the Pussycats. A little remix riff of New Order’s “Blue Monday” in the background was a nice 80’s nod to our favorite teen movie Queen, Molly Ringwald. Chock full of 80’s songs this week, a cover of “Bette Davis Eyes” plays while Jughead is lovingly looking at Betty. I have been firmly set in the idea that it’s Clifford Blossom, and after this week, it would appear Cheryl is also suspicious of Clifford. The penultimate episode promises to reveal the identity of the killer and it would appear that reveal comes in the form of a recording of Jason’s death. Yikes!